Not valid with any other offer. Limit one per customer. New customers only. Here at The Royal Banquet & Conference Hall, we know that every events requires different needs and each event planner has a variety of desires, tastes, goals and budgets. People who want to improve their event/meeting experience while also creating a sense of community, choose The Royal Banquet & Conference Hall. Our business model is based on a partnership with you-the customer. We take the goals and objectives of the client personally and actively listen to every detail to that we can deliver a premiere product the first time around. The only thing you have to do-celebrate the success of a perfect event! Tell your friends, family and colleagues, and come back to do business with us again soon. Let us help you create the memory of a lifetime! With flexible and adjustable space floor plan will be changed as per your needs and requirement for ceremonies and receptions, The Royal Banquet & Conference Hall is the ideal location of any event of 100 to 800 guests. 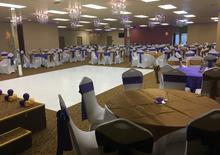 Had an amazing experience at Royal banquet hall. We hosted our son’s first birthday party there and so glad that we got this venue. Owner Karan is professional and an honest man to deal with, the whole experience was such a delight. The hall itself is so pretty and has such a nice lighting features and surround system. Can’t say enough praise for the place, it’s way more than what we expected. Will be doing all our future parties there. Thank you Royal Banquet Hall team for creating such a nice experience for us, you guys got customer for life.